Welcome to MOSA, home to Italian greyhounds that are distinctive, outgoing, and full of personality. All of these qualities are what distinguish our puppies and dogs from many you will find and make them a perfect choice for those who want an Italian Greyhound as a family companion. 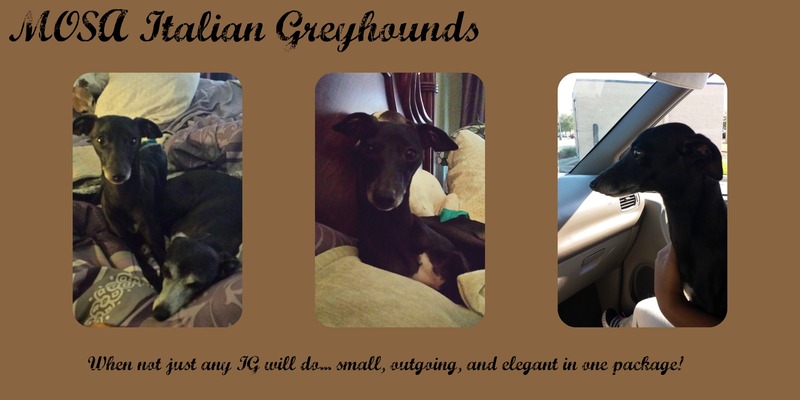 We have researched extensively and worked hard to put together what we consider a great group of Italian Greyhounds and are sure once you see them you will agree. Our personal research and education on the breed never ends as we feel you can never know enough and we strive to maintain our knowledge of the breed. Our dogs were selected not only for their beauty and conformation to the AKC Italian Greyhound standards but, for the overall health that has been proven and bred into the lines we have selected. We selected our IGs from what we consider to be the best of the best. Our breeding is planned carefully doing our best to adhere to both the IGCA ethics and (AKC) breed standards: health, gait, temperament and conformation as well as what some forget an outgoing personality! Our Italian greyhounds are very distinctive in looks as well personality. We have been blessed and fortunate to have been able to have such great dogs as well as such great mentors to guide us and those that entrusted us to allow their dogs to become a part of our family and the foundation for our breeding program. We are not a kennel our dogs are first and foremost a part of our family, just as they started out, living in our home and interacting with us on a daily basis. Not in a separate kennel as many breeders choose to do. Not that kennels are bad but we feel that to truly be a part of the family and have the proper socialization they should be in the home. This is our choice and desired method of rearing puppies to ensure they have a sparkling, outgoing personality and are family oriented. In return when you adopt a MOSA puppy or dog you can trust you are adopting one that is suited to family life. Not one that is "timid" or "scared" and runs off from you. When you first meet your New IG you will fall in love instantly. Distinctive type and friendly, outgoing personalities are what make MOSA Italian Greyhounds stand out from most and excellent family companions. Italian Greyhounds were not meant to be a breed that is "timid" and "hesitant" with people like so many you may find today. They were originally bred to be a confident, outgoing breed that sought out and preferred the companionship of people. We believe that when Italian Greyhounds are properly bred and socialized you in return eliminate the bad traits you may have heard associated with the breed today and instead you get one that will be a loving family companion. MOSA puppies and dogs are just that very outgoing with a sparkling personality that you and others will notice right away. As well, they have very elegant distinctive looks that will turn heads. We are very proud of all of our MOSA IGs that are bringing so much happiness, love, smiles and companionship to their families in only a way an IG can! Our dogs are chosen for health quality, elegant looks and breed standard, with emphasis on temperament and personality. Raised in our home with love by us to give love to your family. Within the IG breed today there are many variations that differ quite significantly from each other. Our goal and desire is to be consistent in what we produce. We believe to achieve consistent standards you can only do that by starting with dogs that possess those qualities that you wish to produce. In selecting our dogs we have kept to this standard and have only chosen dogs that possess the qualities we want and the best we can find. Our goal is to reproduce those traits we find best and strive for even better. While the AKC has standards that define the IG breed, there are many definitions and choices among breeders to what the ideal IG is and not all have the same idea of what the "perfect" IG is. MOSA's ideal dog is elegant, refined, with an outgoing, confident temperament and personality. We have chosen dogs with these qualities to ensure it in the offspring of our own dogs. What we want to see is a dog that is "POETRY IN MOTION" when it moves and has a very friendly and loving personality. Our dogs are refined and elegant. We breed to the AKC standard but at the small end of the height scale (the height ranges from 13"-18" sometimes more) our ideal and the breed standard is 13"-15" at the shoulders and around 10-15 lbs. We love to see a very expressive face, a deep chest and tucked waist that flow into a nice "S" silhouette shape. Other qualities we like to see are a curve to the top line along with the long flowing legs like a deer to give a nice step in their movement. . The IG is defined as a "toy" and as we breed to achieve standard we also keep the idea of "toy" in mind which for us means a small dog. A lap dog that you can cuddle and hold in your lap, without being overwhelmed with the size, but still within the AKC standards so they can be shown in the ring. Our support doesn't end once you receive your new puppy, it continues for the life of each puppy we produce. We take our responsibility seriously and stand behind our puppies with pride. 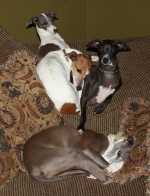 MOSA Italian Greyhounds are raised in our home and interact with us on a daily basis. We do our very best to carefully place our puppies and dogs in their new homes. We provide a written health guarantee with every dog we place. As well we offer support for their families. If we don't know an answer we will do our best to find it for you. You can rest assured and have peace of mind when you choose a MOSA puppy. You not only get a puppy you are part of our extended family. Join with us, responsible small breeders, those who love their animal companions, and the AKC to Protect ALL OF OUR RIGHTS TO HAVE ANIMALS AS PART OF OUR FAMILY AND WHERE YOU ARE ABLE TO ADOPT THEM FROM!! We are asking all of those who view our webstie and love dogs or any animals(as this will afect many not just dogs) to please read over and research the candidates running for office during any voting season and their veiws before deciding on who to vote for as there are some who are supported and believe in The Humane Society of The United States(HSUS) and intend to create new legislation that if passed would affect your very ability to adopt a dog or from where you choose to adopt your dog. It will affect all who show and/or breed, those who have pets as members of their families such as our great families . It is imperitave that we ban together to stop this insanity. We at MOSA beleive and adhere to high standards as do the majority, as most are small show/hobby breeders that keep the dogs in conditions way above those reccommended by any governmental agency. While we ourselves realize that there are puppymills and bad individuals out there that are breeding dogs we also understand there are already protections (laws)for those dogs written already. Those are what we feel need to be enforced not more laws created that would basically undermine and do away with most small show/breeding homes, any breeding, and any pets kept by individuals as this is the agenda of many of these candidates supported and who believe in HSUS as well as HSUS themselves who "say" their proposals are to eliminate puppy mills. If you read their agenda it goes way beyond the prevention of puppy mills. We at MOSA do not support Puppy Farms or Puppy Mills, nor do we allow any of our puppies/dogs to be placed by anyone other than ourselves through our adoption process to ensure they have the best homes. We are providing the message and link below that we recieved and researched as well as articles we found regarding HSUS and urge you to read it and vote to stop this anti pet agenda before it is too late.. Thank you to all of our great famiies and all who take the time to view our beautiful dogs for all of your support and the love you have shown to us and our family..We appreciate all of you and look forward to knowing you for years to come!! We hope you enjoy our website as well find it informative and that while you browse you find the puppy you have been looking for. The site will constantly be changing as it grows so we hope that you will continue to come back even if it is just to see the great puppies and dogs. Feel free to contact us with any questions, to get to know us better or to get your own Iggy.